"We were just passing through, and were lucky enough to pick this place for dinner. Everything is homemade and delicious. The staff was very nice and helpful. If we ever find ourself back in this town we will defiantly stop in again." "Yes the menu only had 10 or 15 items and a lot of people probably have never heard of several but everything we ordered was delicious!..The service was amazing our waitress was super friendly... They were a bit pricey for a small diner but the food was worth it, expect to pay 10-15$ a person which isn't bad...Atmosphere: it had recently been redone, and was adorable and modern"
"Could not wait to try this out after the remodel by the food network. We had eaten here before the remodel once. The server was nice ordered some chili cheese fries and was told they were out of chili. I got barbeque and fries, fries were way under cooked and greasy. Got a new order of fries and the same thing. My wife went to the restroom and could see into the kitchen and saw a bunch of horseplay happening. Paid my bill, never to return." "The restaurant only had one group in the back and 2 single people seated at noon hopefully, they will change their menu and/or prices. 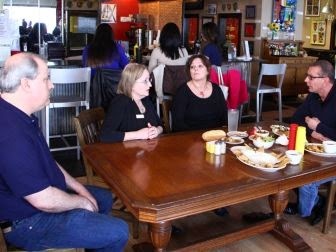 I understand that the food network visited and tried to help with increasing their business - don't think this is the way to go for lunch in the Calhoun area." "I have never gone in to a restaurant and walked out before ordering. I did today. The menu has like ten choices and most of the items consisted of things that I've never heard of. Then, the one thing I thought I might like- Pot Roast was $17! I'm sorry, but that's ridiculous." "They need to adjust the overly priced food in my opinion, its too expensive for something that you can find for the fraction of the cost elsewhere. ANOTHER dilemma, is location, the area that this restaurant is located at, has poor demographics." Here is the Fork Diner Facebook page. In a local article during the makeover Robert Irvine says, "They’ve never made money and they have $375,000 in the restaurant and are losing $12,000 a month. They’re in debt with the IRS to the tune of about $18,000. (They owe) $10,000 to suppliers and the staff hasn’t been paid since January. So you can imagine a little animosity. There are three owners and each has put a certain amount in … and there is a lot of stress. I think something is going to blow up." "We have never taken home a paycheck ourselves, have depleted of all our personal savings & are still massively in debt. We owe back taxes, venders, & most importantly, back-wages to our hard-working & wonderful employees...Although we are now following Chef Irvine's menu & guidelines, and although we have brought in a new General Manager & Partner, and some of the original partners are leaving, we are finding it impossible to catch up on the back taxes & wages. We do NOT want to claim bankruptcy--we want to pay what we owe! Your donations would be so very much appreciated. Thank you, Gray Bridges, Co-Owner, The Fork"
On the Fork Diner Facebook page, under the post advertising their GoFundMe, campaign, the Fork Diner says, "RI gave us a new menu & kitchen procedures & of course remodeled the front of the house, but 2 issues...lotta debt left over from before they came & then summer hit in Calhoun--and ya know what that means...slow slow slow for restaurants & retail. I expect we're gonna get busier after the show airs, but the past debt is still overwhelming....Yeah, location is a problem. If we can turn this thing around we'd love to move to 53!! Note RI gave us those prices & they're comparable to other "casual fine dining" restaurants in Calhoun & Dalton"
The reviews since Restaurant Impossible visited are mixed and people do not seem to like the small menu and high prices, while some people complement the food and service. The reviews before the makeover were not too bad and people also seemed to like the food and service. The fact that they started a GoFundMe fundraiser hoping to raise $25,000 for unpaid debts doesn't seem too promising for the restaurant. It also doesn't seem too ethical for a business to do that. They are basically saying they want free money to help pay their bills. And this is after receiving a free $10,000 makeover along with national exposure for their restaurant. Also, the fundraiser description is all about paying debts, and says nothing about wanting to keep the restaurant open. It seems like it is more about avoiding bankruptcy than saving the restaurant. This may be a restaurant that doesn't stay open too much longer, and it will be interesting to see if people actually donate to their fund. Stick a fork in them...they're done. Sounds like yet another group of people who had no business opening a restaurant. I'm honestly surprised they still have staff if they aren't getting paid, and the IRS will take their share sooner rather than later. Their Facebook talks about a new gm/partner and I was confused about mike and Diana's involvement. I think the owners are the same, but they just have a new GM and chef to run the restaurant. A post made about 4 hours ago says "gray, Diana and mike are not running the restaurant...Rena is"
Ugh I wish they stop painting the restaurants green! They look horrific and corny. I thought it looked like a leprechaun threw up. Ugh! I'd say opening a gofundme account shows that they aren't doing too well. A lot of people are blowing up on their FB page due to the fundraiser. Some are calling them scam artists, things of that nature, something tells me this place won't been open for very long at all. So fork in the road had rather beg for money to pay bills instead of improving the restaurant . I'm a disabled veteran in debt. Can I start a fund raiser? Not only that, but do they realize that they're going to have to pay taxes on the contributions they receive to help pay down their tax debt? Oh, the irony! People are doing it for everything now, go for it! According to 'gofundme': While this is no means a guarantee, most donations on GoFundMe are simply considered to be 'personal gifts' which are not taxed as income in the US. Even as I was watching the episode I felt that The Fork was not long for this world. At a certain point when you're so far down in the hole financially it becomes extremely difficult to dig yourself back out. The $18000 in tax debt that was mentioned on the show is just the tip of the iceberg. Most "successful" RI makeovers tend to report a 30-40% improvement in business after the show. In this case it would be too little too late. I was one of the cooks that was there when Robert showed up, I left because of the no pay and how nasty the kitchen was roaches everywhere. They have since got a new General manager & partner Rena Clark. She has added almost 20 items to Roberts menu. Gray is still there, she claims she can't leave because a loan she took out takes a percentage of the credit card sales and until its paid off she is still a owner technically. Bull she can leave but she is still responsible for the debt. Diana has left and looking for a new job. Mike I think is still there working some. All the old staff is gone either fired or quit. The gofundme account now has been reworded as a memorabilia site and they are given rewards for the money donated. Also if you go to either of their facebook pages The Fork Diner or The Fork Restaurant casual fine dining becareful what you say because if the don't like it they will delete the comment. I have never heard of this account and only found out about just now as you mentioned it. So, thanks for that. I am sorry to hear that they are NOT doing well...this business is tough and not for everyone, that is for sure! Thanks for the update. Good to know. I think that RI should invest their money to more worthwhile causes...in the future...why sent 10,000.00 down a rat hole? You're welcome and I agree, the restaurant business is not for everyone. Good insider info Red, thanks. Sorry that you and the other employees were not getting paid. I'm surprised people stayed at all under those circumstances as we all have bills to pay. I hope you've landed on your feet in a good job. Duchess, if you think that is bad, the first Hotel Hell episode of this season was just broadcast on 7/21. I was there during the filming and am even in the episode for about 3 sec (big whoop, I know!) and during the episode Ramsay said they put $150,000 into this 14 room boutique hotel and restaurant in the few days they were there trying to help save it! It was Meson de Mesilla in Las Cruces, NM if you want to check it out. Yeah, it seems these people thought that the only thing needed to run a successful restaurant was money, and didn't do their homework before jumping into such an expensive and difficult endeavour. I can't believe them. You would think they would do a crowdraiser to pay all the hard working employees that have not been paid since January! That is where the money should go! The one lady got money as a settlement or inheritance and wanted to make more money. Should of put it in CD's at the bank, ma'am. She put 300K? in of her own money and let this married couple, I think, put in 75K and THEY HAVE 50 PERCENT OWNERSHIP!! They should have 25 percent, right? Not each, together. I can hear the Shark Tank now! Mr. Wonderful is SPINNING in his pile of money right now! They might of just asked the show to come and put up with it, get it cleaned up for free and try to make some money off it and then sell the restaurant and try to make a profit off it. In some of the shows, it sure looked like they were doing that all along. Like Ducky's? and that one in PA, with the hateful mean women. It is closed now, but they own it and can sell it. If you post a comment on Facebook, only the person who posted it can delete it. Do they have a magic eraser? Oh, yea, Mr. Clean sells them! The Health Inspector that inspected them should be fired. It is a miracle nobody died from the gross kitchen and food. The people that 'own' the page can delete the comments whenever they want. I posted on the page for a bestselling author because her new book was $15 for the Kindle version. I said I'd read all her previous books, but that $15 for an e-book was just over the top. The comment was deleted within 10 minutes of posting. Simple reason for the troubles they have. Money management. They should have never been delinquent on taxes in the first place. Another words, they spent over $20,000.00 that was collected, and still never paid the employees! That should have been a major red flag. Someone has been putting money in their pockets. The go fund me site is another red flag. To pay down debt, you work hard at it. It is no different than holding a sign at the end of a freeway ramp, begging for money. I feel bad for the workers that did not get paid. I suspect the owners didn't have a problem paying their bills. Like I said, that was the owners fault for not saving the collected tax dollars, and spending it. Robert Irvine should have ripped into the books, and determine where the money was going. I was hired the week before Robert showed up and only because I have been to culinary school and had Servsafe, but did not find out the money problems tell they started filming. I left as soon as I found out. I worked 70 hrs during the week Robert was here. I got my money 2 weeks later after only threatening a lawsuit and refusing to leave the property. Glad you got paid finally, but it's a shame it had to come to that. I can't see what would cause a person to stay and work when they aren't getting paid. It's nuts. UNREAL. All that money from Gray, not paying taxes, not paying employees, free makeover and nat'l publicity from RI and still going online to beg for money. That's pro level conning. Why didn't Robert grab their ledgers like he's done with other restaurants? How were they losing so much money? Whole thing was fishy. As of 9/20/2014 they have closed. They posted a week before they were closed for a kitchen remodel and then on the 20th had a sign saying closed for maintenance but have actually closed down. Heard a new restaurant was going into the building but not sure if that is true or not. I guess they closed the restaurant to go into pan handling full time.